Betsy Ross Flags that featured the Stars and Stripes design for the first time were stitched by seamstress Betsy Ross, at the request of General Washington. The design features 13 stars to represent the original 13 colonies with the stars arranged in a circle. 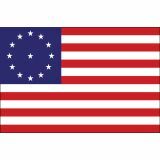 The Betsy Ross Flag was adopted on June 14th 1777, later known as Flag Day. Shop from our Commercial Grade, durable, and 100% made in the USA Betsy Ross Flags and get the advantage of the best prices, quick shipping, and much more! 100% customer satisfaction guaranteed! Celebrate the legend of Betsy Ross, the humble seamstress who stitched the first flag of the United States in the stars and stripes design or the emerging nation, which had gained independence against all odds from the biggest empire in the world at the time, by waving these beautifully crafted Betsy Ross Flags from Tuff Flags. Our Single face reverse flags made of 200 Denier are finished with durable duck heading and brass grommets for hanging our flags. The UV resistant Dupont ink ensures the best colorfastness for these outdoor flags that are reinforced with lock stitching to make it wind resistant. Made with accurate scale, these flags will make great commemorative items and keepsakes.